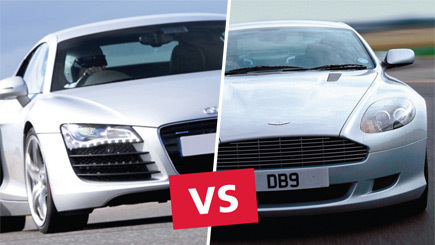 The stunning modern classics that are the Aston Martin V8 Vantage or DB9 - or the futuristic, high-tech Audi R8? Who could possibly make a decision to choose between these legendary vehicles? That's why this experience offers drivers the chance to drive both marques. Begin with a safety briefing and introduction to the track, to ensure drivers are comfortable before taking the wheel of one of these iconic Aston Martins. Make the most of a full six miles driving around the track and put this car through its paces, before taking the wheel of the Audi R8 for a further six miles. After twelve miles of supercar driving, decide which is king, and receive a memento certificate to take home too. Minimum height is 5'2'', maximum is 6'6''. Maximum weight is 20 stone. A full British or international manual driving licence must be produced on the day in order to participate. Lasts approximately two hours. This includes a briefing and 12 miles of driving in total. Please arrive 45 minutes in advance of the booked time to ensure a prompt start. Up to 30 people take part. Your briefing will be shared with a group. All driving is held on a one-to-one basis. There tend to be large numbers taking part at weekends.